It seems that every side of Napoleon Bonaparte’s life, personality and activities is researched and described both in scientific literature and in fiction. So this is on a topic that might be less known to the Western reader, namely,The Great Fire in Moscow . After the French victory, many Corsican rebels fled to the mountains, where they continued to fight on. But Napoleon’s father Carlo, a twenty-three year-old university student, readily submitted to French rule. 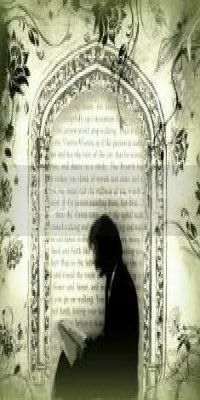 Soon he was wearing powdered wigs, embroidered waistcoats, and silver buckled shoes. The Bonapartes were Corsican aristocrats, but they were not rich. With eight children, they struggled just to get by on an island that had been impoverished for centuries. 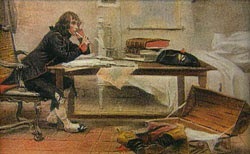 As a representative of the Corsican parliament, Carlo traveled to Versailles. There, he saw the splendor of the French court in all its majesty, and he worked to secure Napoleon a scholarship to Brienne, a private academy in France. He thinks of himself as a Corsican. He is surrounded by students who are the children of French aristocrats. And they have nothing in common with this little foreigner. And since he is quite proud, he becomes a loner. When he was in school in Brienne in continental France, where he was very much laughed at and bullied for being a barbarous Corsican, he dreamt all the time of…liberating Corsica. But he did something quite exceptional. He conquered his conquerors. He got the better of the French. At the age of fifteen Napoleon was promoted to the Royal Military Academy in Paris. At sixteen, he began his apprenticeship as a lowly second lieutenant, training with the best artillery unit in the French army. His ambitions soared far beyond a military career, but in French society power and achievement was reserved for the nobility — not for an unsophisticated Corsican soldier. Then the French Revolution changed everything. Bonaparte was twenty-three when he took leave of absence from the French army and returned to Corsica an idealistic revolutionary. The French Republic had made Corsica a part of France, and given Corsicans all the rights and liberties of French citizens. 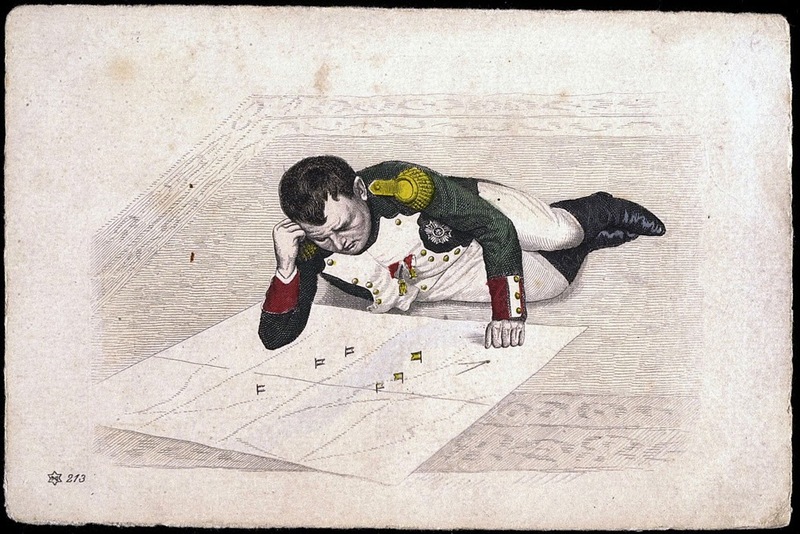 Bonaparte, a lieutenant in the island’s National Guard, threw himself into Corsican politics. Bonaparte soon became the leader of a faction opposed to the island’s governor Pasquale Paoli. The Corsican patriot thought Bonaparte too ambitious, too self-centered, and too sympathetic to France. Bonaparte and Paoli are on totally different wavelengths. Paoli retains the idea that Corsica should be independent. By this time Napoleon Bonaparte is perfectly comfortable with a Corsica that is part of revolutionary France. Clan rivalry ran deep on the island, intensifying the political struggle between the two men. Paoli’s partisans and Bonaparte’s were soon at war. In the end, Paoli proved too strong. Bonaparte’s home was sacked and he was forced to flee to the mountains. On June 10, 1793 he set sail for France with his widowed mother, three brothers and three sisters – a refugee family carrying with them all they owned in the world. Twenty-four years old, he was banished from the land of his birth forever. By 1812 Napoleon had conquered the whole of continental Europe - from southern Italy to the Baltic, from Portugal to Poland. 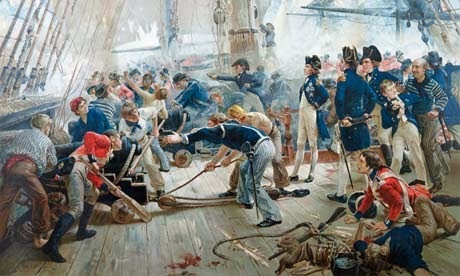 England herself he couldn't get at, not after the Battle of Trafalgar of 1805, when Lord Nelson had defeated the combined French and Spanish navies. Despite this, Napoleon hoped to undermine the economic superiority of Britain, by banning trade with her and excluding the products of the 'nation of shopkeepers' from European markets. In 1807 the Tsar of Russia, defeated for the second time, had agreed not to trade with the British, but harsh economic reality spoke louder than treaties, and Russia continued to trade despite the ban. 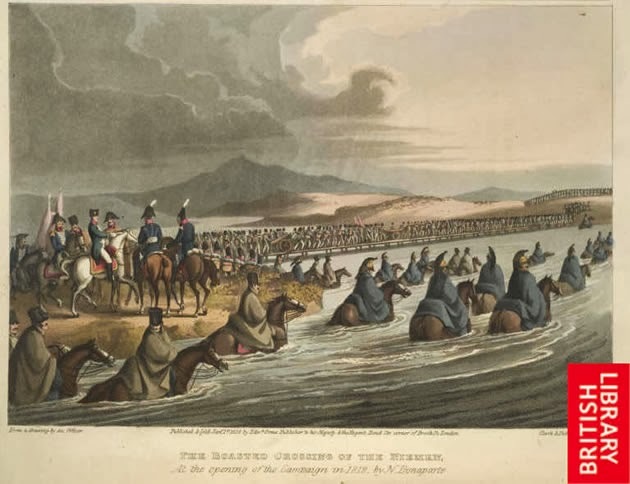 In response, on Midsummer Day in 1812, Napoleon crossed the River Niemen into what was then the Russian province of Lithuania, in a bid to conquer Russia with the biggest, most spectacular army Europe had ever raised. This army consisted of almost half a million men, only half of them French.The rest were drawn from Napoleon's European empire, the result of his conquests over many countries. Some of these, including Holland, for example, he incorporated, along with their armies, into France. In this way he had an almost inexhaustible supply of soldiers. 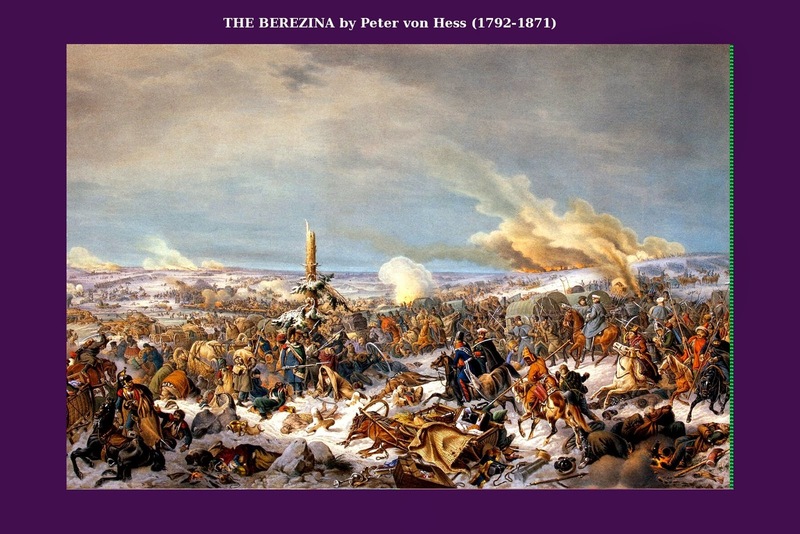 The Patriotic War of 1812, or the Russian Campaign of Napoleon as it was called on the West, occupies one of the most remarkable places in the century-old and reach of events Russian history. 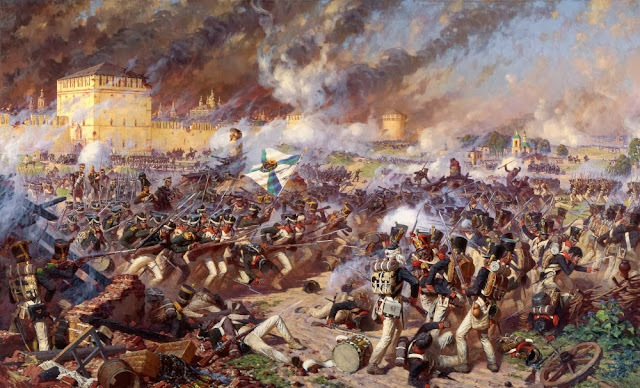 The Patriotic War of 1812 had become the beginning of the end of Napoleon's Empire; Russia had become the place of the destruction of the Great Army. Now Napoleon had ten army corps, against the Russian Tsar's two. After a 'good battle' (as he called it) with his 'brother the Tsar', to bring him back into the fold, he planned - perhaps - to march their combined armies to India, and strangle the supplies of British gold that had been financing successive coalitions against France. The entire Russian campaign, in fact, was actually aimed at Britain. Many events were contained in this heroic epoch: long and heavy retreat of the Russian armies in land, a bitterness of defeats of the first months of the campaign, the tragedy of the surrender of Moscow to the enemy, the triumph and the joy after enemy's proscription from the limits of Motherland. The officially given reason for the invasion was Napoleon's desire to defeat Britain. Because of Britain's power at sea, Napoleon could not even think about overcoming her without powerful allies on the Continent. Russia was a key power that did not cooperate in closing her ports from British trade and thus enabled Britain to survive Napoleon's tactics. Another and perhaps a more important reason was that Napoleon's and Alexander's interests were in competition when it came to acquiring new territory. Alexander I resented Napoleon's seizure of Oldenburg on the German coast and was suspicious of Napoleon's plans about Poland. Alexander himself had absorbed a large portion of Poland, which made Napoleon fear that Alexander might want to take the rest of it, too. There was a third, more personal matter that might have had some impact. In 1808, Napoleon was planning to divorce his wife Josephine for not giving him a child and to marry one of Alexander's sisters. When Alexander's older sister, Catherine, married, Napoleon requested the younger sister's, Anna's, hand. 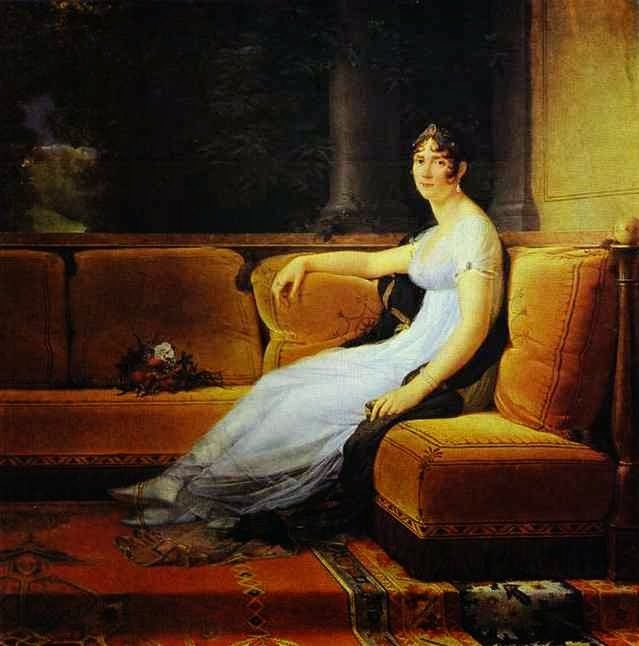 Anna's mother despised Napoleon and refused to give her daughter to Napoleon, saying that Anna, at fifteen years old, was too young to marry and that Napoleon would have to wait until she would be eighteen. 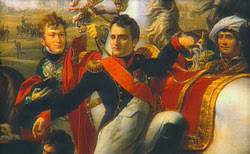 Napoleon correctly interpreted the response as refusal, which caused Alexander and Napoleon to distance from their temporarily cordial relationship. 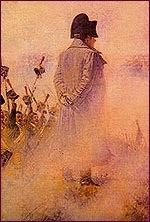 On June 24, 1812, ignoring the advice of his closest advisors, Napoleon invaded Russia. Never in living memory had so large an army been assembled — Italians, Poles, German, French — more than 600,000 men from every corner of his empire. Napoleon prophesied the war would be over in twenty days. Advancing to Moscow, Napoleon waited outside the city gates for prominent civic authorities to greet him and to discuss terms of surrender. None arrived. Moscow had been deserted. As the Napoleon's troops noticed that they would not be threatened by Russian troops in Moscow, they went on unauthorized pillaging trips, gathering whatever treasures were left behind by wealthy Muscovites and feasting on wine and delicacies. Nothing went as planned. There was no battle in Lithuania - where the French leader had hoped to start his campaign. The Russian army simply withdrew. This made it possible, four days later, for Captain Victor Dupuy of the French 7th Hussars to gallop into Vilnius, at the head of the invading army. The faster the Russians withdrew, the further Napoleon was dragged into Russia. Tens of thousands of soldiers, many of them very young French and allied soldiers, died of exhaustion, thirst or starvation in its summer heats ('worse than anything we'd known in Egypt'). Then at Borodino, a week's march from Moscow, the French and Russian armies, by now about equally matched, fought to a sanguinary standoff. The battle of Borodino was a brutal slug-fest. Napoleon threw his enormous army at the Russians in a frontal assault, showing little of his old strategic subtlety. The battle began at 6:30 in the morning and lasted until 3 in the afternoon. At that point, both armies were exhausted. The Russians fought the Emperor's armies to a standstill. The next day they withdrew, leaving Napoleon proclaiming victory. Napoleon was undeterred, however, and marched on to the almost deserted Moscow, which the next day was sent up in flames - burnt down by its Russian governor. Whether it was started by the drunken soldiers or by patriotic Russians, is not clear although the Russians clearly had had the intention to burn the city as all the fire-engines had been rendered unusable and fire-floats had been sunk in the river. After the Battle of Borodino, on 13 September 1812, the chief commander of the Russian Army Michael Kutuzoff, against the will of most of his generals, issued an order to retreat from Moscow. 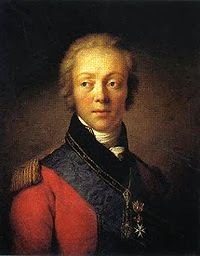 Count Rostopchin, the Governor General of Moscow, received the news of the army's retreat at the last moment and was hard pressed to evacuate his own family with no time to organize the evacuation of the city. 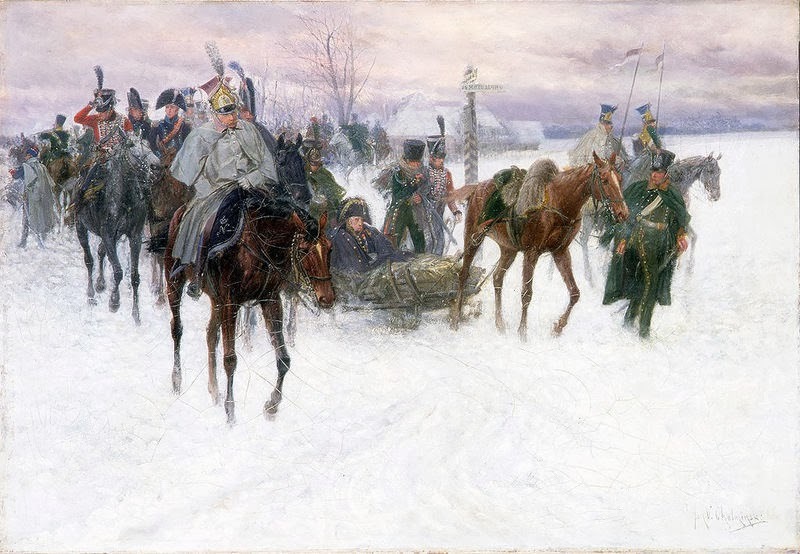 Nobody expected such a turn of events, least of all the citizens of Moscow, who, on one hand, were not morally ready to accept the power of Napoleon, but, on the other hand, had not undertaken any measures to evacuate the wounded and sick, or any tangible property. The Moscovites simply stood up and left the city. “The brightness of the morning was magical. Moscow seen from the Poklonny Hill lay spaciously spread out with her river, her gardens, and her churches, and she seemed to be living her usual life, her cupolas glittering like stars in the sunlight.” (Leo Tolstoy War and Peace). If Napoleon had hurried to enter the city he could have caught the rearguard of the retreating Russian army and many of her leaving inhabitants. “Meanwhile Moscow was empty. There were still people in it, perhaps a fiftieth part of its former inhabitants had remained, but it was empty. 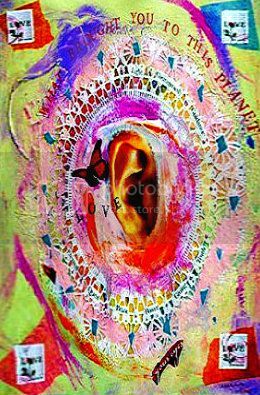 It was empty in the sense that a dying queenless hive is empty.” (Tolstoy). 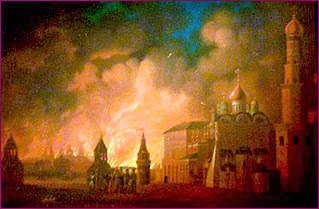 Approximately an hour after our entrance into the city, the fires started… we thought that looters from among us set the fires unintentionally… We didn't think the Russians were so barbaric that they would set fire to their property and destroy one of the most beautiful cities of the world!” (cited from Vereshchagin's Napoleon in Russia). Though tattered, hungry, worn out, and reduced to a third of their original number, the French entered Moscow in good marching order. It was a weary and famished, but still a fighting and menacing army. But it remained an army only until its soldiers had dispersed into their different lodgings. As soon as the men of the various regiments began to disperse among the wealthy and deserted houses, the army was lost forever and there came into being something nondescript, neither citizens nor soldiers but what are known as marauders. 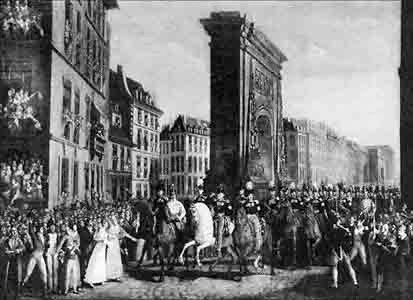 Napoleon entered Moscow the next day, on September 15. His head-quarters were in the Kremlin. Napoleon knew what the Kremlin meant for Russians. 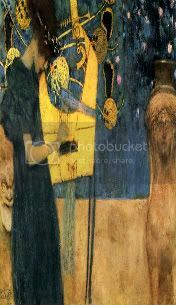 For several hours the emperor was happy and proud - he was in Moscow, in the Kremlin, in the palace of the tsars! He thought that the aim of the campaign was achieved. Here, in the Kremlin he would sign a peace treaty with the Russian Emperor on his own conditions. The French leader hung around for eight weeks, arrogantly waiting for the Tsar - who was in St Petersburg - to make peace. The Tsar, however, was by now in no mood for negotiation. 'My campaign, led by General Winter, is just beginning', he said. 'There can be no peace with Napoleon.' Napoleon, laden with booty, eventually set off to lead his army back to France, just as winter was approaching. He issued his first orders to arrange stability in Moscow. After 24 hours of plundering, it was time to restore order. But the morning of the next day turned into a horrible tragedy. A hurricane that started in the morning, spread the fires across the city; Moscow's left bank was a raging inferno, the stores on the Red Square caught fire, very soon the streets around the Kremlin were also blazing. The strongest wind picked up burning pieces of wood and brought them down on the buildings of the Kremlin. One of the towers caught fire. Soldiers rushed to put it out as there was a depot of powder in the Kremlin that could explode at any moment. 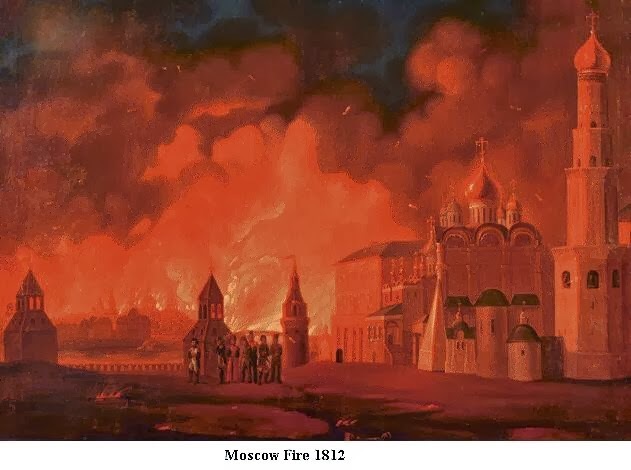 Napoleon, with some of his aides, hurried to leave the Kremlin, but there was nowhere to go – the fire was everywhere and soon they lost their way. That might have been the end of the great man, but for the soldiers of Marshal Davout, who were looting the city that day. They met Napoleon among the flaming buildings and evacuated him by a route where the buildings were already burnt to ashes out of the city. That night Napoleon stayed in the Petroff Palace, outside Moscow. ‘On Wednesday in the morning the hurricane of wind started and the fire began to spread with enormous speed. Within an hour the whole city was on fire, a sea of fire, waves rising sky-high, spreading desolation and horror throughout. The air over the city was a burning mass, spitting embers in all directions, and the firestorm was still growing. Never did our Lord in His anger, present a spectacle more horrible than this: fire everywhere, looters trying to escape with nowhere to run. Churches burning, houses burning. It was like the boiling of Hell, everything breaking, collapsing. 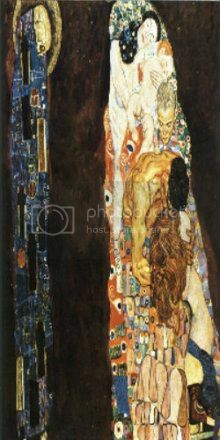 Burning logs rolling through the streets and embers cascading, red-hot sheet metal falling from roofs, the intense heat makes it impossible to breathe, and impossible to run: the cobbles of the street are hot as a frying pen. Belltowers are all aflame, the bells breaking loose, tumbling, falling…” One of Napoleon's soldiers recollected. A soldier named Labaume witnesses, ‘The fire soon caught in the best quarters of the city. In a minute all those beautiful buildings, which so aroused our admiration, were destroyed by it. ‘Many officers rushed to find shelter in the [Petroff] palace,’ wrote Philippe-Paul de Segur (1780-1873), Napoleon's aide-de-camp. ‘The commanders, including the Marshal Mortier himself, had been fighting the fire for 36 hours and were exhausted! Everyone was silent, we accused ourselves. "Mountains of red, rolling flames," Napoleon recalled later, "like immense waves of the sea. 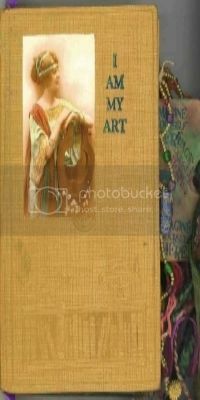 Oh, it was the most grand, the most sublime, and the most terrifying sight the world ever beheld." 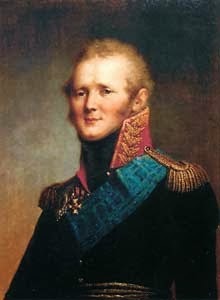 ‘However tempting it might be for the French to blame Rostopchin's ferocity and for Russians to blame the scoundrel Bonaparte, or later on to place an heroic torch in the hands of their own people, it is impossible not to see that there could be no such direct cause of the fire, for Moscow had to burn as every village, factory, or house must burn which is left by its owners and in which strangers are allowed to live and cook their porridge. 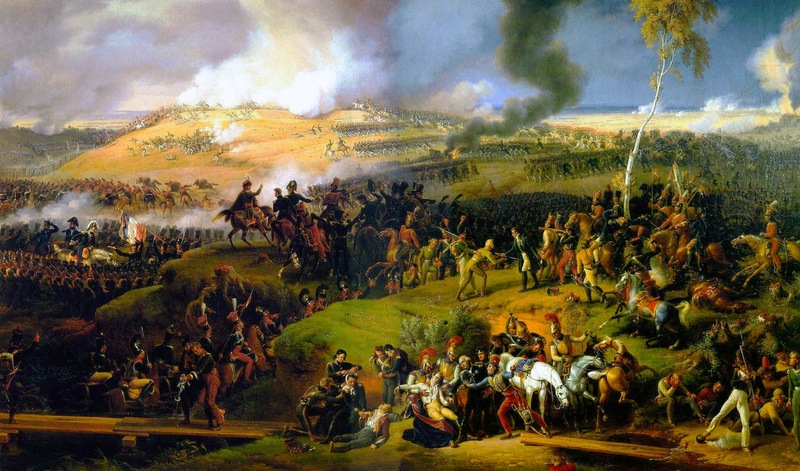 The French army had to retreat by the Smolensk road, by which they had come and which was looted by war. All other roads were blocked by Russian troops and partisans, who seized practically all the transports with food and forage. Winter came unusually early that year with very low temperatures, which are extremely dangerous especially for the hungry. Many French soldiers just froze to death. By November 24 only 70-75 thousand reached the river of Berezina, almost half of them were sick, wounded, and had no arms. Standing in the icy water, the French field engineers built a floating bridge. The crossing was attacked. It's difficult to say now, how many soldiers. Napoleon lost in that battle, some historians give the number of 20, others 35-80 thousands. Only 30 thousand reached the west borders of Russia. Napoleon had lost about 80,000 men from diseases alone. Napoleon could have lowered the casualties if he had brought more doctors and more supplies. 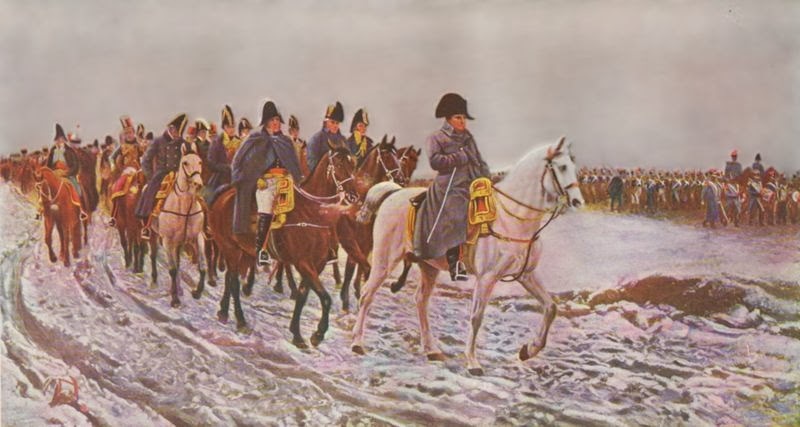 Napoleon regarded his army as mere numbers and did not contemplate that they would be affected by hunger and fatigue. 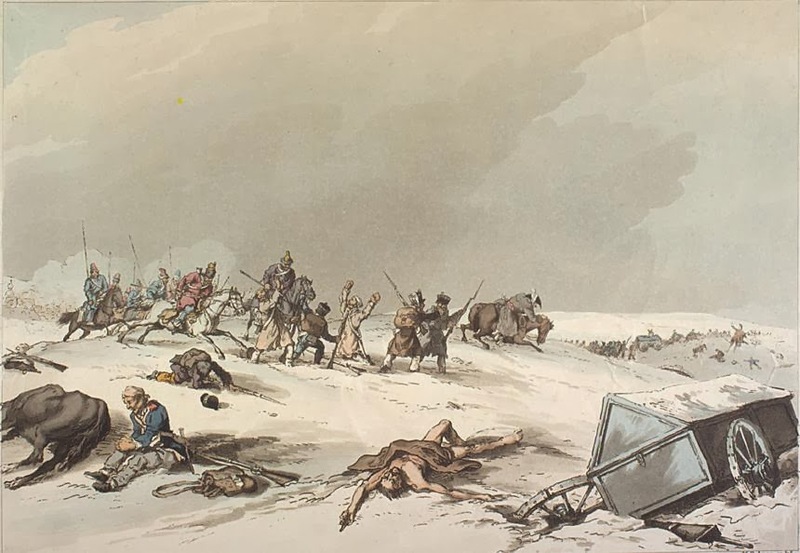 The abandoned army was left struggling in the extreme cold. December 6 was the coldest day, with -38 degrees C. About three quarters of the army froze to death that night. The army arrived at Vilna on December 8. The famished men got out of control: they invaded warehouses and private houses, fought over food and a warm place to sleep in. However, they were not able to rest long. The Cossacks were about to enter the city, and Murat ordered the army to resume the march. Many ignored, preferring capture. The decimated column, still harassed by some Cossacks, then moved on, aiming for safety beyond the Niemen River, 70 more miles distant. 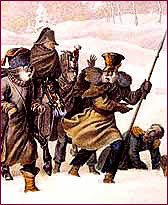 The final survivors crossed it at Kovno December 13 and 14, after one last fight at the town's river bridge--by some estimates only 5,000 to 13,000 men in fighting fettle out of Napoleon's original force of nearly 600,000 men. 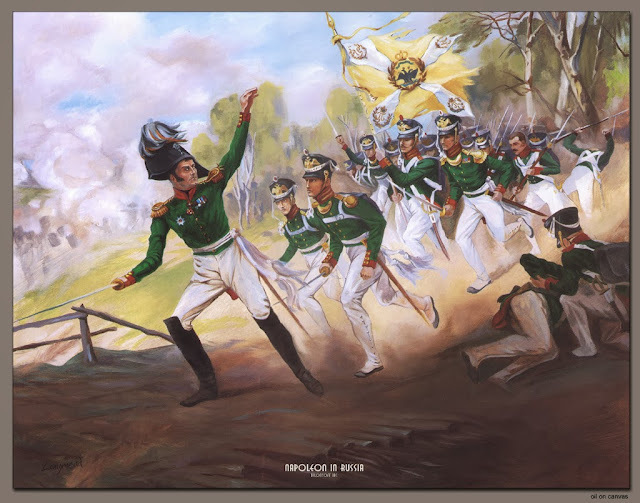 Historians are still perplexed as to how and why the huge Grande Armee of 1812 was not only unsuccessful in the invasion of Russia, but why it was largely destroyed in that long, difficult campaign. Napoleon did not lose the war out of military errors but of a simple miscalculation - a miscalculation that was made by Hitler a century later. Napoleon believed that if he occupied Moscow, the Russian government would collapse and he would rule Europe with little opposition. But as history reveals, this tactic does not work and Napoleon is defeated, paving the way for other nations to deny Napoleon's lust for power. After the Russia incident Napoleon's Empire fell apart. England, Russia, Prussia, and Austria allied together to fight the French. The French had to retreat. Then on March 30, 1814 the allies captured Paris. Even Napoleon's generals realized it was a lost fight and gave up. 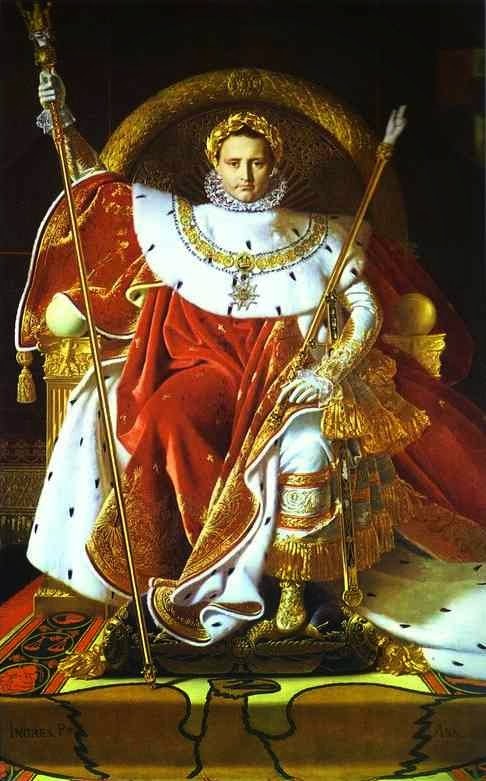 Napoleon was forced to abdicate the throne on April 6, 1814.